Every thing was sliding down hill except the capitol and part of that seemed disposed to join the exercise -- sealing the fate of the assemblymen it were. (If that decaying ceiling would only their attention to the future state as much as life insurance it would be a great gain.) Albany was full of visitors for two days and this must have profited our citizens financially unless visitors like John Gilpin's wife "although pleasure bent," "had a frugal mind." The glories of our new capitol were temporarily eclipsed by ice palace in the park which had several advantages over its legislative competitor -- it had no smell of gas, was much better lighted, did not require to have the snow shovelled off the roof, and did not tumble down so soon as was expected. Besides, it cost nothing to take care of it would it not have been a happy expedient to the Assembly into it while their hall is repairing. It would have hastened legislation, at least, or curtailed it, which is better. 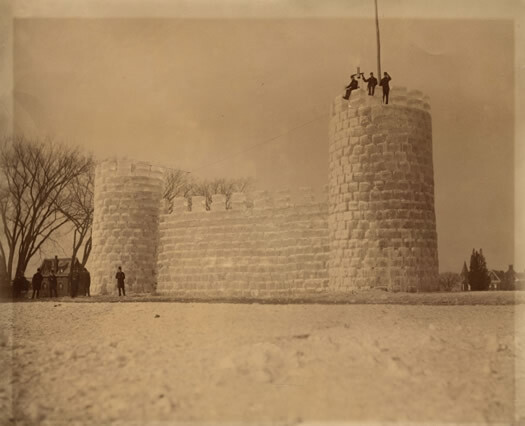 The carnival was brought to a close by a pyrotechnic bombardment of Fort Orange (of ice) in Washington Park. Gov. Hill witnessed the exhibition from Mayor Thacher's sleigh. Nearly all the legislators were seen in the crowd, which numbered several thousand. The display of fireworks was grand and the bombardment pretty. The attack was led by posts of Sons of Veterans, snowshow, and bobbing clubs. This ended Albany's first Winter carnival. A few year's back Albany Archives turned up an illustration of the fireworks display. -Ice Palaces of Considerable Size? I don't think they exist.